Each year, Wake Forest University’s Office of Sustainability recognizes campus change agents who work to create a more adaptable and resilient Wake Forest community as “Champions of Change.” This year’s fifth annual Campus Sustainability Awards celebration took place on March 20 during the Office of Sustainability’s week-long celebration of the Earth. Hilary Floyd, Academic Skills Instructor and Program Associate for Community and Lifelong Learning, was honored as a Champion of Change. 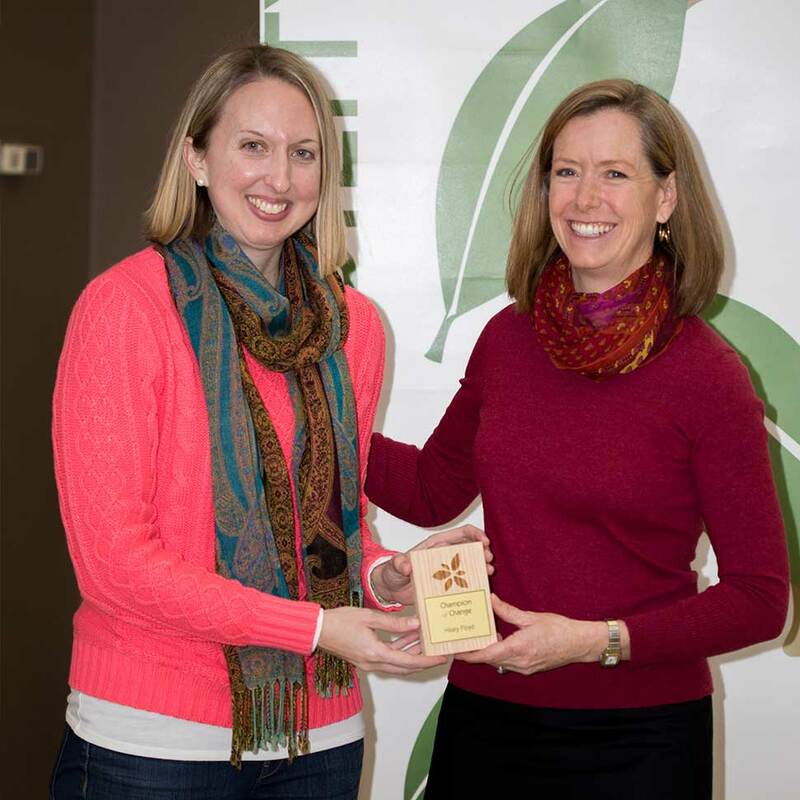 As the Green Team captain for the School of Divinity, Hilary supports colleagues and graduate students in implementing sustainability practices. She has helped the school switch to 100% post-consumer recycled content copy paper and aided the transition to online applications in the Office of Admissions. In addition, she supports “Commonplace,” the School of Divinity’s student sustainability-focused organization, in their efforts to collect food waste for composting at the school’s twice-weekly lunches. 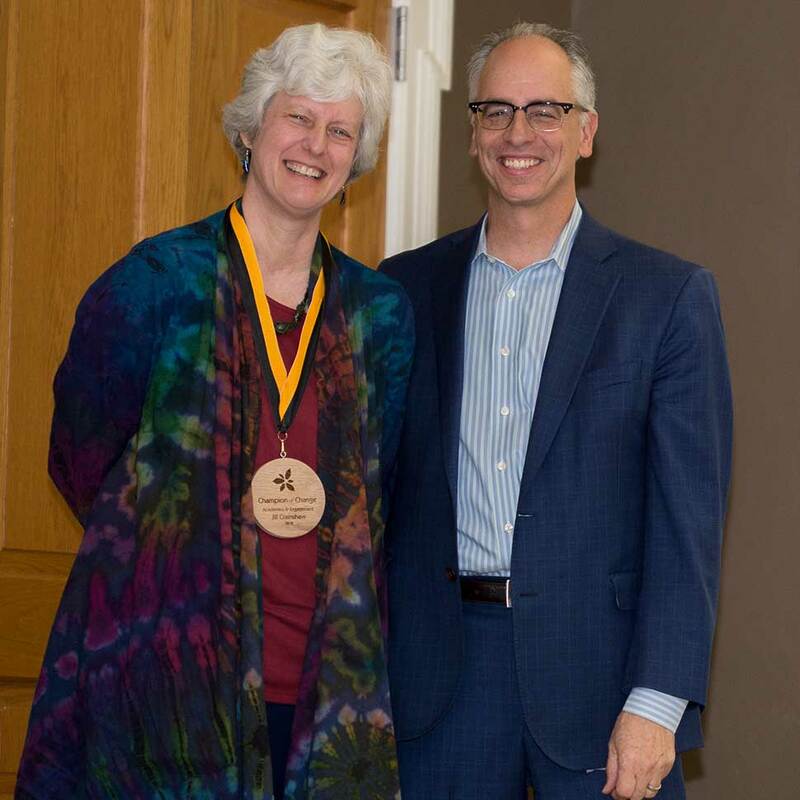 Jill Crainshaw, Acting Dean and Blackburn Professor of Worship and Liturgical Theology, received the 2018 Academics, Research, and Engagement award. Her course, “Sacraments and Ordinances: History, Theology and Practice,” took a place-based educational approach to exploring liturgical and sacramental rituals like baptism and the breaking of bread. She facilitated active engagement with the needs, hopes, and possibilities of the inhabitants of particular places, training ministers and theologians of all types to attend to local needs of the living communities where they lead. Dr. Crainshaw regularly teaches about sustainability by taking students to explore local waterways and to meet local bakers, farmers, and vintners, where they can connect to place and contemplate all aspects of environmental stewardship. These are well-deserved awards and highlight the School of Divinity’s sustained and evolving commitment to providing religious leaders the opportunity to engage and reflect on the relationship between well-being, food, and ecology. Learn more about the Office of Sustainability. Photos courtesy of the Office of Sustainability/Sean Yen.